We are John and Janie Chitester, although I, Janie, do most of the blogging. After 20 years of being involved in Military ministries with Berean Mission Inc. and the Navigators, where we had a strong emphasis on discipleship, the Lord opened up the opportunity for us to be involved with discipling pastors in foreign countries with Ripe for Harvest (now called Harvest Alliance International). Our work has been primarily in East Africa with extensive work in Tanzania, Rwanda, and Democratic Repubic of the Congo (DRC). In 2009 we lived in Kigali, Rwanda for 8 months, meeting weekly with different groups (pastors and church leaders) and individuals teaching them basic principles of discipleship and how to implement them in their churches and in individual lives. It has been an exciting and humbling time of ministry for us! The African people are so gracious and giving, with so little, they desire to give so much. They are so eager to learn and come faithfully to gather up whatever we have to offer, so they can deepen their intimacy with Christ. It has been a true experience of grace in our lives. Although we have a home in SC we make frequent and sometimes extended trips to Africa to build on old teachings and establish new ones. I hope as you check into the blog from time to time, you too will get a glimpse of what God is doing in Africa and other places, to bring Glory to Himself. Blessings! If you want to give online you can go to: http://harvestallianceintl.org/giving/ Then just put our name in the “donate to” box. God speed and we look forward to hearing what our Lord and Savior has planned out for you in Rwanda. We will keep you in our prayers as “we give thanks to God always for all of you, making mention of you in our prayers”. 1 Th 1:2. We’ll be looking forward to your posts on this blog site; and we wish you a safe and fruitful journey. Hopefully, when you return, I’ll be able to travel once again; and we can meet you some place in your travels to FL, visit you in S.C., or you can visit us, if we have a house, when you return to the U.S.
Tanzania, we have friends in full time orphanage work there with whom you might like to meet. They have an incredible ministry. Hey your site looks great! Cindy & Kane will be leaving soon to return to China. It has been so nice to have them here this year. Bonnie was here this morning, passing through, on her way back to China. Her mother passed away so she just went to the funeral. Bonnie’s memory is pretty bad & it frustrates her. Have a wonderful time of discipling the folks in Africa. I will pray for you & look forward to hearing how it goes. We leave for the Solomon Islands on May 30. Hey your site looks great! Cindy & Kane will be leaving soon to return to China. It has been so nice to have them here this year. Bonnie was here this morning, passing through, on her way back to China. Her mother passed away so she just went to the funeral. Have a wonderful time of discipling the folks in Africa. I will pray for you & look forward to hearing how it goes. We leave for the Solomon Islands on May 30. Hey, I hope all goes well there and many come to know Christ and many are being equipped to share and teach their faith, May the Lord be with you. Matthew 28:18-20 good job guys. Thank you for this wonderful post. How timely for our current situation. This is what we seek – for the Lord to place us where He would have us to be, to lead us to the home He would have us to purchase, and lead us to be involved in the church family He has for us. We desire to be properly placed in His mosaic for our lives. We are each one, a one of a kind work of our Creator; so, for Ken & me, we seek anew, to know where the Lord would have us to be, and how He would have us to serve Him, as we move into a new phase of our lives, where we will be permanently settled most of the time, except for occasional traveling. We seek to fit into His mosaic, as He would have us to fit. The Lords’ timing is always perfect; and so it was with this post you sent to us today. Again, we thank you for it. It doesn’t matter ones’ age, how old, or how young, seeking the Lords’ will and walking with Him fills everyday with His Joy, Peace and His love for others around us. I know I’m repeating myself; but we are praying for your safe journey back to Africa, and for a fruitful ministry during your time there. We’re already looking forward to your return; and we pray we will get to spend a little time with you upon your return to the U.S.
I’m sorry that this difficulty I’m having kept us from getting to see you in Beaufort. Please continue to pray for my healing, and for us to follow the Lords’ leading in choosing a home and a new church home in Jesup. Cool blog setup. My prayers will be with you as always. Keep us updated as the Lord works His wonders. Gods Blessings to both of you. We wish you a successful trip and a safe journey. Our prayers and thoughts are with you both and your family back here in the states. Will visit your site often for updates. Anything we can do here for you, let us know. God Bless. Great looking blog. I look forward to your posts and will continue to pray for you and your ministry. I’ve been asked to come to a Christian Friends of Israel Conference later this monthn to sell my new book on Islam. I’m excited to see what the Lord has put together. I’ve never been asked before. Usually I’m the one begging for permission to set up a table. I pray the Lord’s blessings on everything you’re doing. Now that the wedding of my daughter has taken place (at the Parish Church of St. Helenas), I am catching up with emails. I welcome you back to Beaufort and will pass on your wonderful news and blog to those whom you met at our church. Thank you again for your visit. 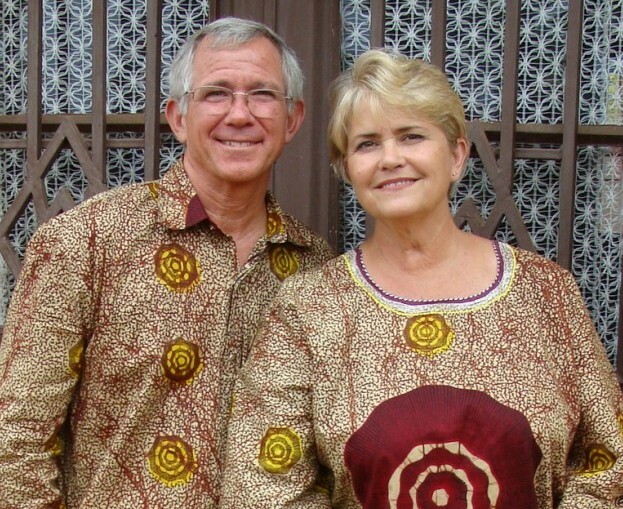 John and Janie, thank you for the investment you make in people’s lives all over the world. I am a product of your ministry. It is hard to believe that 20 years ago my wife and I met you and Janie. Our lives were a mess and divorce was eminent. You took us into your home every Sunday afternoon and discipled us. You raised us up in ministry and launched us into the world. I look at my life now as a pastor, missionary and a leader in my community and can’t believe how much has changed. Lisa and I just want to say thank you. Your investment in us has touched countless other lives that we have ministered to. it is exciting to see how you have a burden to africa. what you are involved in right now I mean training disciples is the most needed within our churches so that the church of the lord can be very strong. So May God continue to bless you.You are most welcome as the Macedonian Says to Paul Come over africa for help. Thanks Joy, So glad to know you are there and praying! MERRY CHRISTMAS AND HAPPY NEW YEAR FROM BOB AND CATHY MONTGOMERY. IT IS WONDERFUL TO SEE THE MINISTRY THAT GOD HAS GIVEN YOU. THANKS FOR AVAILING YOURSELVES OF HIS GRACE. YOU BOTH GLORIFY YOUR LORD. Blessings upon your family and your ministry. Thanks Alex, Blessings to you and your family as well. Celebrating our Savior with you!! Merry Christmas to you both and may God continue to use you in a huge way throughout the world. You are truly faithful servants. Ed, So fun to read about all God is doing through you as well. May He bless you richly this year as you faithfully serve Him!! Merry Christmas John and Janie! As we bring in the year of 2012, may God continue to bless you both and may He allow your efforts in discipleship to continue to be fruitful. We love you both! Joe, blessings to you and the family! You have been a faithful encouragement to us and many others I am sure. Have a great Christmas season!! Love you guys! I wanted Just to let you know that we love You guys and are consistently praying for you.especially for the trip Mission in march with pastor Chris. Janie: How many times I have felt the same way, whether returning to Haitifor the 50+ time for back to Nigeria or Pakistan. What encourages me the most is the verses in Ephesians 1 and 2… I was chosen before the creation of the world to be holy, blameless, to be the praise of His glory and am His Handiwork, created to do good works which He prepared in advance for me to do! And again..It is He who works out everything in conformity with the purpose of His will! God knows and understands our hearts and our feelings and He still works things out for His glory. God is in control….To God be the Glory, Great things He has done and will continue to do through you! Thanks for being faithful in prayer you guys!! Thankful to God for your willingness to go and teach in difficult places when you could be home with family. We praise God for the ministry he has given to you. Thanks for the updates you send. Thanks, we truly enjoy it!